For one reason or another it has been some time before my ideas for blog posts have actually made it into cyberspace. So why now, well I have an idea, an inspiration and decided now was a good time, as generally it always is. Having said that I decided to do something today, that I have said no to for quite a few months, because only now was it the right time. Anyway back to the purpose of this blog post, one of the responsibilities I have taken on since my last blog post is volunteering as chairman of the St Albans Operatic Society since February this year, as well as having performed in two more shows. Although we are a society that puts on amateur productions we have high standards and on average spend in excess of £50,000 to put on our two shows a year at the Alban Arena in St Albans. Therefore this wasn’t a responsibility I took on without some reasonable amount of consideration. Having said that it has taken up a lot more of my spare time than I expected, I guess with any role you don’t really know what it involves until you do it. It is certainly a rewarding and challenging role, it helps to be passionate about the society. Of course I don’t do it all alone I have a great committee of 9 other members and we run the society together, with additional help from the other committed members. As a charity most of our funding comes from selling tickets for our shows, so how well we sell a show can dictate what shows we can afford to do in the future. 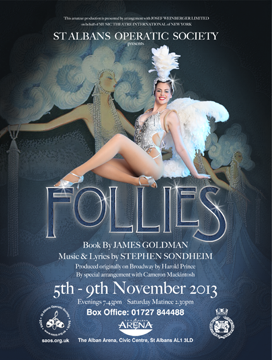 Our current show Follies that opens on Tuesday 5th November, 2013 was a challenge to sell, traditionally that is the nature of Stephen Sondheim musicals, even though they have some of the most engaging music and as with our production some very revealing costumes! So you may ask why choose a show that we are likely to lose money on, if the money from tickets sales is our primary source of funding! The answer to this comes from why the society has survived for 60 years, we love to perform and entertain the people of St Albans, so sometimes we might do a show that we feel is more entertaining or can involve a lot more of our members, even if it is not a big seller. Follies is a great example of this where we have a cast aged from 17 years to 70+, not many shows give us the opportunity to get that wide an age range involved. Our cast includes some beautiful showgirls, a film star and someone that has performed on the west end stage, it does make me proud that we can attract such a cast to perform our shows. Follies is going to be a fabulous show, if you’re coming to the show, I will be in the foyer every evening, so come and say hi.